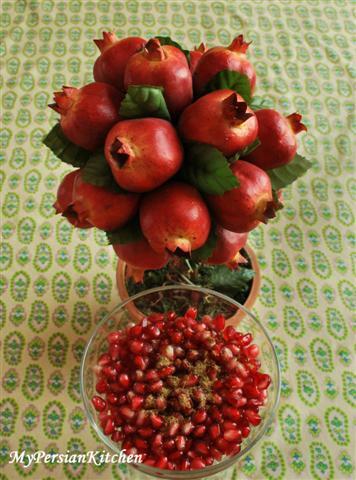 It is safe to say that Persians LOVE Anar, pomegranate. There are no ifs, and, or buts about it. I always looked forward to fall for a couple of reasons when I was a kid. Let’s be clear, going back to school was not necessarily one of them. 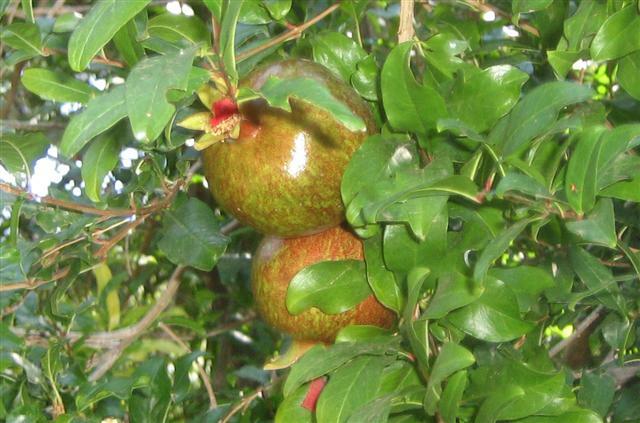 There were precisely one nice pomegranate tree and three persimmon trees in my grandmother’s property. Fall meant picking pomegranates and persimmons and eating them right off the tree if I chose to! There was something truly magical about seeing the foliage change color while these two types of fruit matured on the trees. The pomegranate would turn into a vibrant red while the persimmons tuned into a deep orange color. Pomegranate starts small and on the green side. As it matures the color changes into red. It is ready to be harvested when it turns into a bright red. Since it is officially fall, even though it was almost 80 degrees around here, I proclaim this week to be “Pomegranate Week.” I have already professed my loved for pomegranate in a previous post when I made Asheh Anar, Pomegranate Soup. 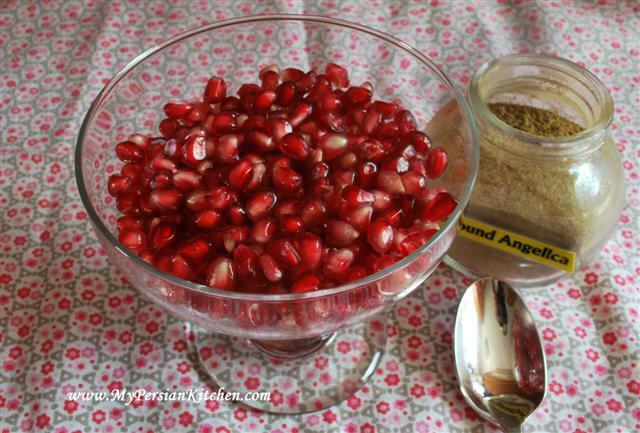 Today’s post is how Persians usually like to eat pomegranate. It is a simple two ingredient recipe…but it can get a little messy! 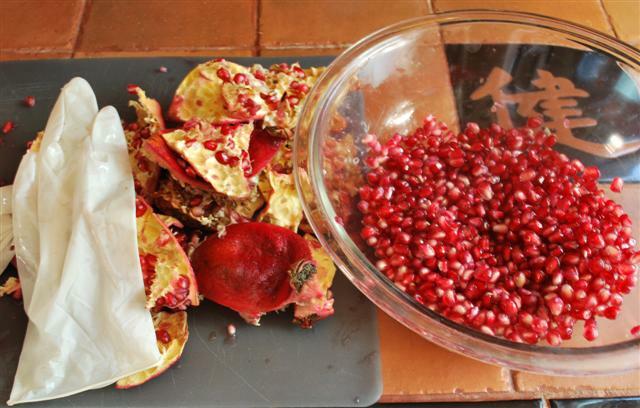 Cut pomegranates in four sections. Removed the seeds and place them in a bowl. I would suggest using gloves for this fun and messy part. Also, you may not want to wear a nice top while doing this….you may live to regret such decision! 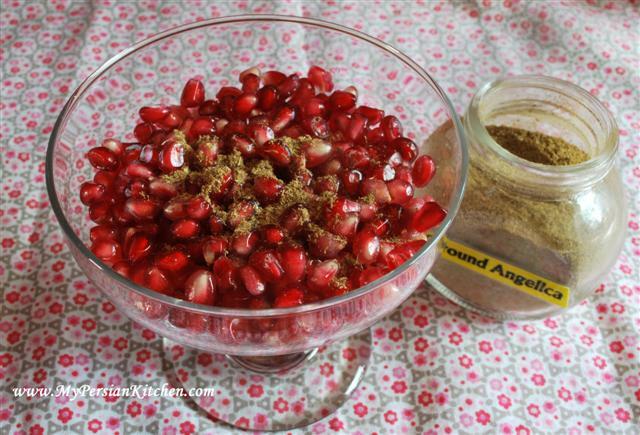 Place some of the pomegranate seeds in a nice bowl. 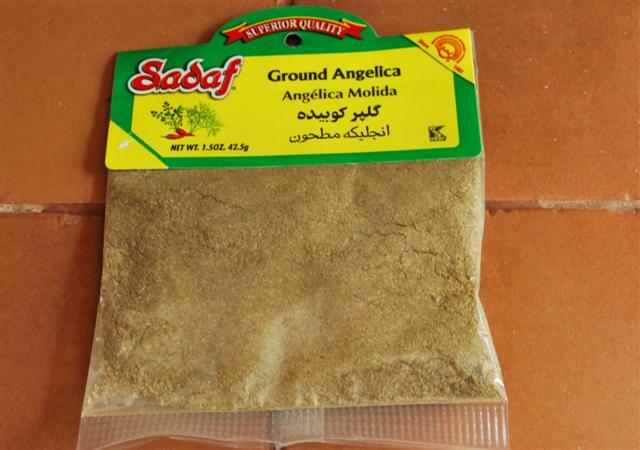 Sprinkle a bit of Ground Angelica on top. 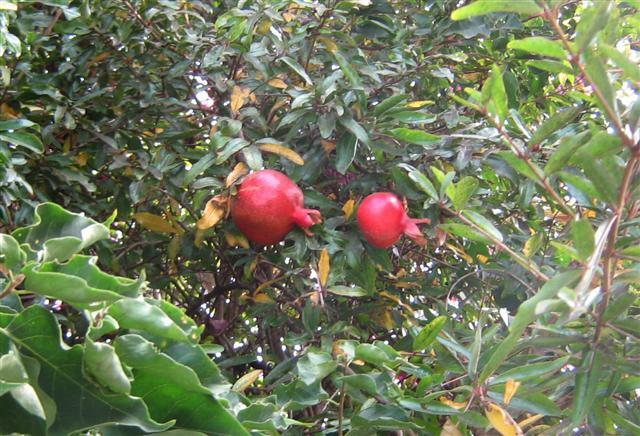 One of the oldest and most beloved fruits known to mankind, the red pomegranate, native to southwestern Asia around the Caspian Sea, has been grown in countries such as Iran, Iraq, Turkey, Armenia and Israel for more than 3,500 years. Love love love pomegranates! Thanks for sharing that interesting article. Indeed, pomegranates are a delight! 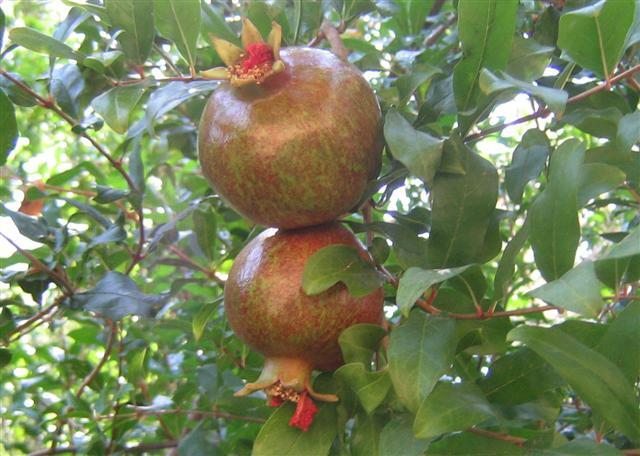 One of Croatian words for pomegranate is ‘nar’ – I see now where it might be coming from! I just started to read your blog, and haven’t seen everything yet. I thought the article was pretty fascinating. I also loved the interview that I posted in the Beet & Pomegranate Salad. We eat Pomegranate with salt. i love Cucumber with salt also. I love it. I find that if I fill a large bowl with cold water and pull the pomagranate apart while under the water, there is no messy splatter and the job gets done much faster. Also, the seeds sink to the bottom and the white parts float to the top which makes it easy to separate. The Croatian word is from the Turkish version, nar. Itself a borrowing of anar. Nar in old Turkish also means fire., which makes it a very suitable word for this fruit.